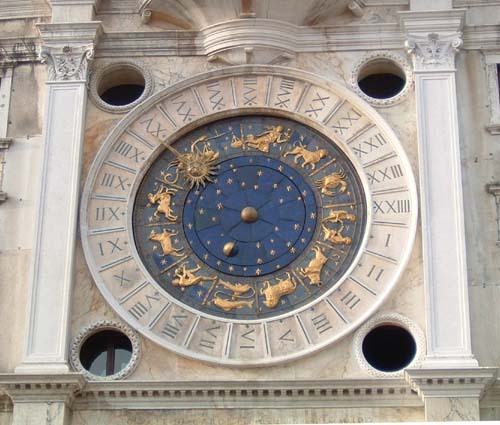 South clock face to the St. Mark’s Square. 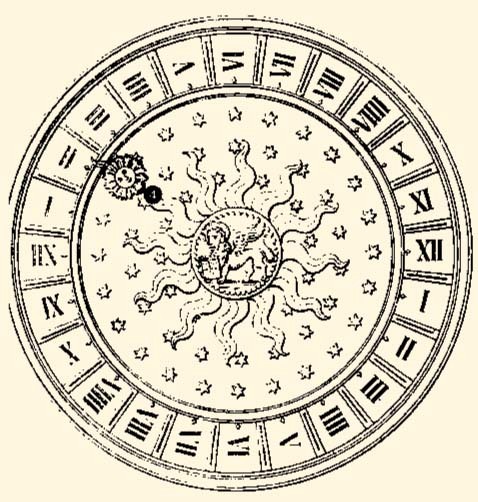 This clock face comprises: a fixed marble circle inscribed with the hours in Roman numerals; a mobile larger ring, bearing the signs of the Zodiac and the related constellations, the names of the months and the number of the days; a thinner ring bearing the hour hand in the form of a sun with a long ray; and an inner disk with the Earth (at the centre) and the Moon, which rotates on its axis to represent its various phases. 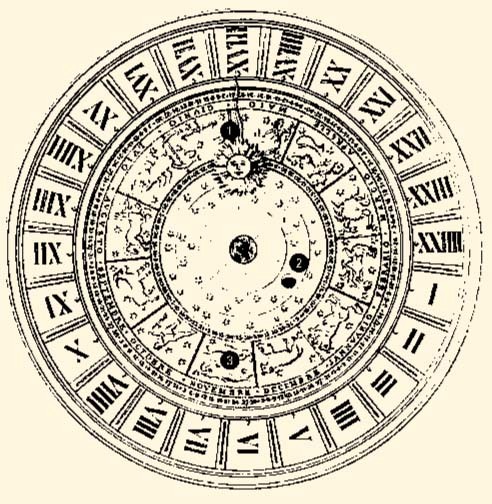 The clock face as it appears nowadays is the result of a simplification of the late 15th century original, which also had the planets laid out according to the Ptolemaic system, each with its own ring so that it could rotate independently. The moving rings are in wood faced with stout sheets of copper enamelled in blue, with the numbers and the stars in gilded embossed copper; the signs of the Zodiac are particularly well-crafted and date from the original clock face. With the passage of days and months, the different speeds of the rings mean that the symbols of the sun and moon enter into the various constellations of the Zodiac. North clock face to the Merceria. 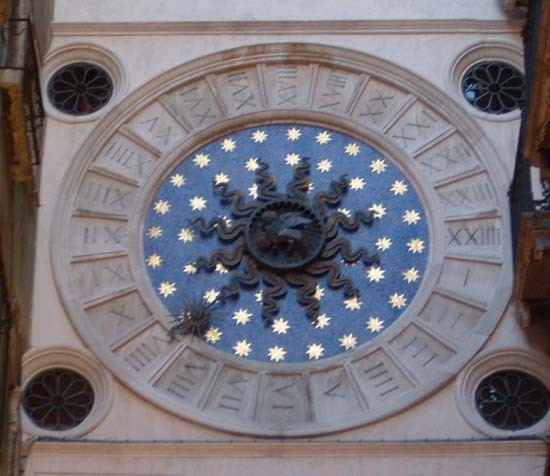 This clock face comprises: an outer fixed ring in marble, inscribed with the hours in Roman numerals, within which is a tondo of mosaic scattered with golden stars. Inside this is a moving disk (about 170 cms in diameter) of flaming rays in embossed copper, with traces of original gilding; face of the sun serves to indicate the hours. At the centre is a copper St. Mark Lion; once gilded, this serves to cover the end of the axle transmitting power to the cloc -hand. Read our Privacy and Cookies policy to find out more.